Every two years, the non-profit community in New Hampshire teams up with designers, architects, construction companies and contractors to donate time, money and materials to build or renovate a selected non-profit facility in need of renovations or new space. The 2018 Building on Hope project has been very special to all of the many participants as we clearly witnessed. In the video, at about 45 seconds in, you begin to see the genuine, warm and deep emotion in Co-Chair Johnathan Halle as he makes brief remarks and he was not alone! You can see the gratitude in the faces of the women who walk into their new living space. It’s just fantastic! Opportunities like this make construction one of the most rewarding professions because of our ability to physically transform real estate, which can potentially save lives. 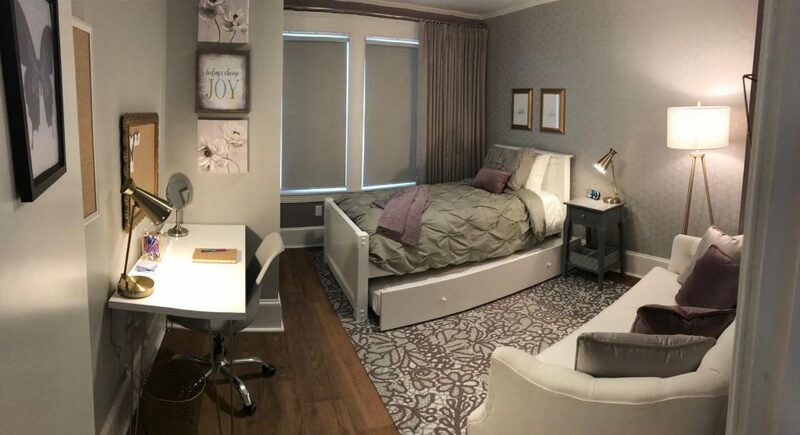 In this case, Meridian Construction worked with designer teammate, Jenn Rowe of Goedecke Decorating in Bedford, to fully renovate a bedroom. We also donated 11 brand new beds. Whether you’re a non-profit that needs building rehab or are interested in donating time, money or materials to New Hampshire Building on Hope, you can contact the organization or one of the steering committee members found online here.